I have a very strong, personal connection to the Terminator franchise. When I first saw The Terminator and Terminator 2: Judgment Day (arguably my favorite action movie ever), I remember being in awe of not just the smart and exciting action scenes/set pieces, but also the disturbing, time-bending scenario at the root of the story. They were fascinating movies through and through and I consider them seminal works in my cinephilic development. But considering the lackluster (albeit entertaining) efforts that were the next two entries in the series, I started losing hope that those once glorious heights could be reclaimed. And now having seen Terminator Genisys, it’s become abundantly clear that this series peaked nearly 25 years ago and unfortunately, there’s nothing to suggest that it’s hit its nadir. Humanity, led by the legendary John Connor (Jason Clarke), has Skynet and its machine army on the ropes. 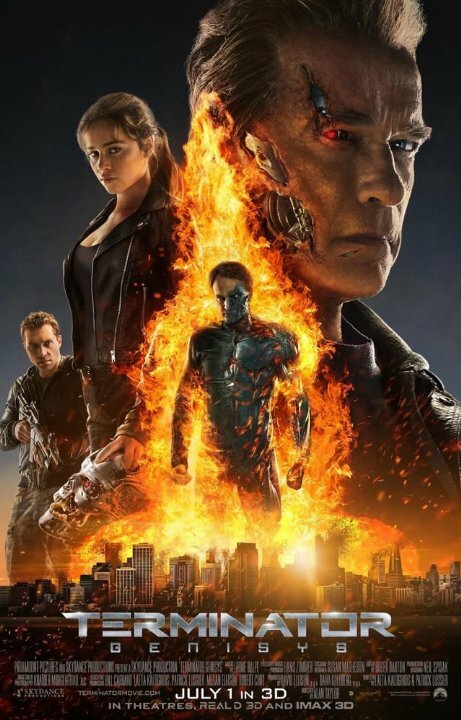 As John knows though, Skynet has one last, desperate gambit: it will send a Terminator (Arnold Schwarzenegger) back in time to kill John’s mother, Sarah Connor (Emilia Clarke), to prevent him from ever being born. 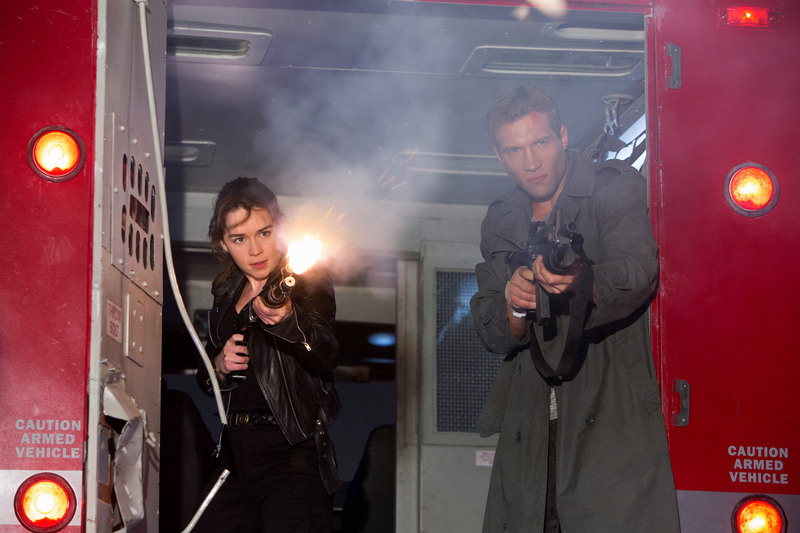 But this time when Kyle Reese (Jai Courtney) is sent back to save Sarah, he finds that the timeline has been dramatically altered and that Sarah doesn’t need saving anymore, as she has her own Terminator (Arnold Schwarzenegger). However, the consequences of this shift keep humanity’s fate in the crosshairs and a new threat is unleashed. Time travel is beyond a risky proposition as real-world possibility, and it can be just as downright devastating as a story-telling device. Structuring a story on the basis of time travel almost inevitably leads to glaring plot issues and logical fallacy. The beauty of the two original Terminator movies was that most of the movie didn’t really depend on the logic of time travel. James Cameron feeds us time travel as a way to get the story started… but once that Terminator gets going, the story is focused on finding a way to survive an unstoppable killing machine. We don’t have the time or inclination to get bogged down in trying to make sense of the implications and minutiae of time travel. The Terminators came from the future and they need to be stopped for the good of humanity. That’s all we need to know and that’s all we get. 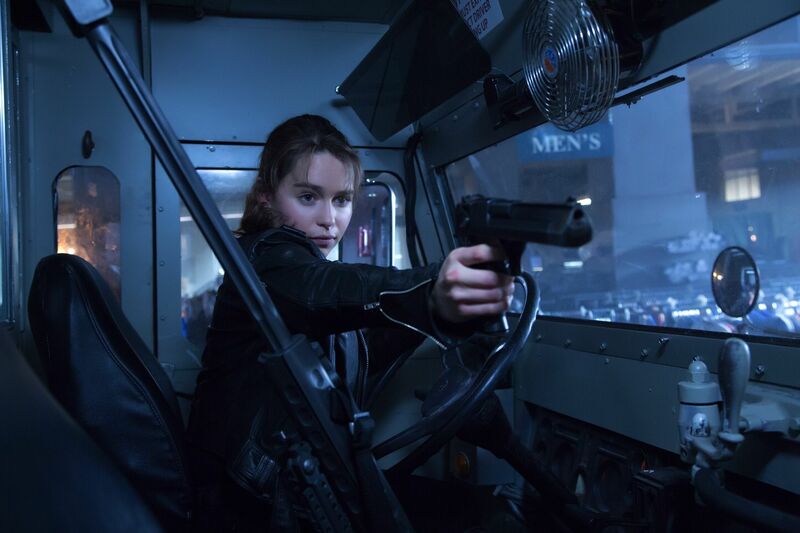 In Terminator Genisys, however, way too much of the story hinges on time travel. The audience is introduced to “new timelines” without the most basic of necessary explanations about why and how this timeline was created; we’re asked to just accept it… which could be fine, except that the time travel stakes are continuously escalated and new elements are introduced relating to time travel. We’re too busy trying to decipher how the timeline was disrupted and by whom (questions that will probably will be answered in the next inevitable sequel) to be completely invested in the events of the movie. Beyond the time travel conundrums presented by the movie, the story itself is just muddled. Why are the characters going to this place? What are they actually trying to accomplish there? How does that help resolve the conflicts they’re facing? These questions apply to pretty much any movie but Genisys consistently fails to provide clear answers. For the most part, again, what we get is “Um, because that’s what we need to have exciting action sequences”. That’s a fine justification in a lot of movies, but that doesn’t cut it with the Terminator. To be fair, the action sequences themselves were generally cool with the effects often being pretty dazzling. There were a few moments where I nodded to myself with an, “Ok, that was genuinely cool”. And while I’m always appreciative of moments like that in a movie, they’re not so rare as to be enough to save a movie. There’s no chance at a good Terminator movie without Arnold Schwarzenegger. That’s simple reality. Terminator Salvation, which was not great on its own merits, suffered from his absence (the CGI appearance doesn’t count). Genisys undoubtedly benefits from his return to the legendary role. His having aged is suitably addressed and he is still somehow able to bring life, charisma and energy to what’s supposed to be a stiff, lifeless character. He’s just as entertaining to watch as he’s always been. Another highlight as far as the performances go came from J.K. Simmons as the much-maligned and disrespected cop, O’Brien. It’s a nice change of pace to see Simmons play a weaker, timid character after seeing him overpower in Whiplash. I think I still have yet to see a movie where I’ve enjoyed Jai Courtney’s performance. He’s not bad, but he’s also not particularly interesting, notable or charismatic (I mentioned to Citizen Kelvin that he strikes me as kind of the anti-Rock). 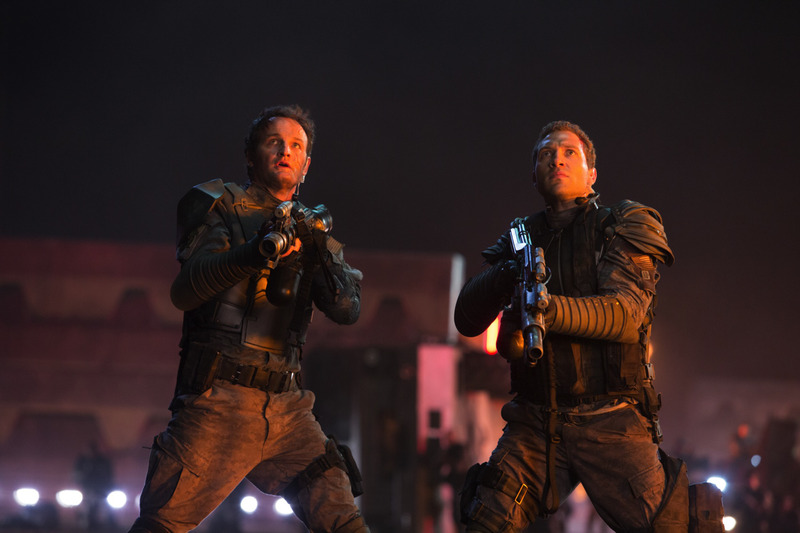 The same applies with Jason Clarke as John Connor. I didn’t have strong feelings about his performance here and that strikes me as a problem given the size and significance of the role. But at least those performances weren’t offensive. Unfortunately, Emilia Clarke was about as horrible a (realistic) choice for Sarah Connor as could have been made. That’s not a knock on Clarke’s acting ability (unsurprisingly, Daenerys is one of my favorite characters on HBO’s Game of Thrones) and honestly, I think she probably did the best she could… but Sarah Connor is just not a character that is right for her. Frankly, Emilia Clarke looks and feels way too soft. 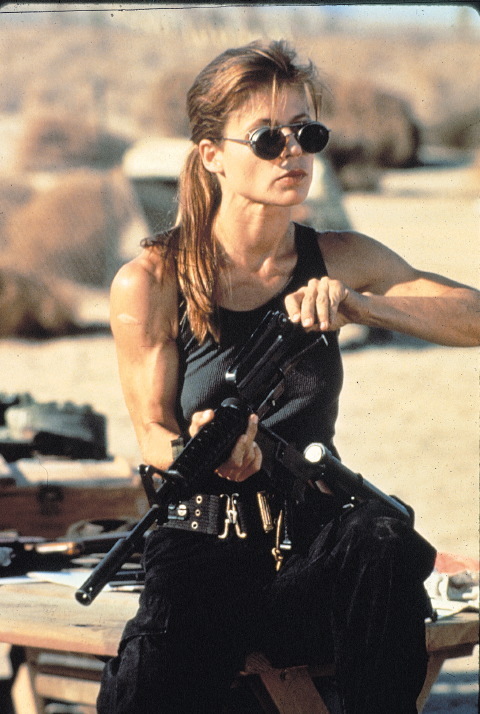 Linda Hamilton’s iconic portrayal of the character is the complete opposite. Sarah Connor is strong and tough and hard. She’s a soldier who takes her grave and overwhelming responsibility as seriously as she possibly can. Yes, Clarke’s Sarah Connor exists in a different timeline than Hamilton’s so maybe one could use that as justification. “Clarke’s character didn’t have the same experiences that Hamilton’s did which is why she doesn’t have the same feel.” I’m not sure if anyone’s actually making that argument, but I’m nevertheless not buying it. Clarke’s Sarah Connor is, for all intents and purposes, raised by a KILLER ROBOT. How is she not a complete and unmitigated badass? Hamilton’s Connor is terrifying and deadly. Clarke’s is far, far from it and that’s not something the movie could recover from. Like the Jurassic Park franchise, the Terminator franchise seems to have exhausted its creative stores. Multiple times throughout the movie, I couldn’t help thinking that this movie really did not need to exist. The callbacks, references and fan service (“I’ll be back”, “Come with me if you want to live”, etc.) are feeling old and tired. Since it seems highly unlikely that this franchise will get the merciful death it needs, the best solution is just to reboot it and give it a fresh start (sadly, without Arnold). I’m going to refrain from making a “termination” joke here. You’re welcome. On the subject of the movie’s trailers… I heard before the movie’s release that the trailers had revealed an absurd amount of spoileriffic information regarding key plot points/twists. The fact that this happened with a Terminator movie is especially disturbing to me. I’ll explain why in an article about my trailer-watching (or lack thereof) philosophy. Stay tuned.